John Keough is a partner in Clyde & Co's global commodities and shipping practice based in New York. John's practice focuses on commodities trading, maritime and shipping law and commercial litigation. He advises and acts for clients in regulatory matters, investment transactions and in commercial trading transactions and disputes, and advises clients on sanctions compliance issues. 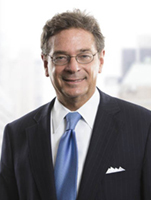 He has litigated complex trading, maritime, insurance and commercial disputes in state and federal courts throughout the United States, including marine fuel oil trading disputes. John has served as lead counsel at trial in state and federal courts, and has argued numerous appeals in the federal and state courts across the country. John also has extensive experience arbitrating maritime and commercial matters, and advising clients in litigation in foreign courts, including such jurisdictions as Hong Kong, Greece and Italy. John's experience covers a wide array of such cases, including international sales contracts, marine casualty litigation, marine insurance, the arrest and attachment of ships and charter party disputes. His clients include commodities traders, investment firms, ship owners, managers, charterers, hull and liability insurers, cargo insurers and P&I Clubs.